The 2011 Drum Corps International Tour will return to the San Antonio Alamodome this summer, as World Class corps travel deep into the heart of Texas for the event on Saturday, July 23. An unanticipated scheduling conflict with the stadium, which serves as a training facility for the NFL's Dallas Cowboys in the summer, caused the event to be relocated to nearby Judson High School in Converse, Texas during the 2010 season. 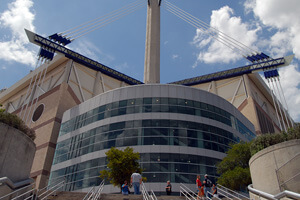 "After the unplanned relocation of the San Antonio event last year, we were very anxious to return to the Alamodome this season," said Susan Kuehnhold, DCI Director of Events. "The current labor negotiations between the NFL owners and the players' union have prevented us from completing the event contract until now, but we're very pleased that we'll be able to showcase the performances of the corps this summer in one of the most fan-friendly venues on the tour." The summer of 2011 will mark the 12th time since 1999 that corps perform at the indoor stadium. Tickets for the Southwestern Championship will go on sale Monday, May 16. Ranging in price from $30 to $55, tickets will be available through Ticketmaster online (Ticketmaster.com) and by phone (800.745.3000) beginning at 10 a.m. CT. A discounted $20 ticket rate will be available to groups of 20 or more by calling the DCI Box Office at 317.275.1212. The Southwestern Championship will feature the performances of 22 World Class corps, marking one of only a handful of times during the 2011 summer tour that nearly all of DCI's corps will compete head-to-head in a single contest. Also highlighting this event that is set to kick off at 2:30 p.m. CT, will be Texas-based Open Class groups Revolution, Forte and Genesis. Learn more about purchasing tickets to the DCI Southwestern Championship. On Sunday, July 24, the day following the Alamodome event, World Class corps will stay in San Antonio for their annual Individual & Ensemble Competition (I&E). I&E gives corps members who have perfected solo and ensemble pieces outside of regular rehearsal schedules to show off their talent. Along with traditional brass, percussion and visual categories, I&E also offers performance opportunities for woodwind playing corps members. "This year in particular I'm really excited about the addition of new vocal performance categories which will give an even greater number of corps members the opportunity to compete," said newly appointed I&E event coordinator Christina Mavroudis. 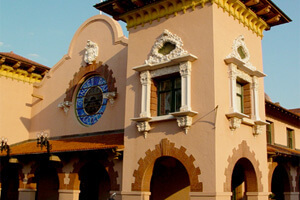 I&E will take place at the historic Sunset Station, a facility located just a few blocks from San Antonio's Alamodome, Convention Center and River Walk. The event will begin at 10 a.m. CT on July 24 and is free and open to the public. "Downtown San Antonio is a fantastic place to make a vacation or weekend trip out of," said Mavroudis. "I hope that drum corps fans will be sure to make plans to stick around the city on Sunday to watch these individuals and ensembles shine." A second Individual & Ensemble Competition for Open Class corps members will take place during the week of the DCI World Championships on Wednesday, Aug. 10 at the Indiana Convention Center in downtown Indianapolis.